The Caboki is formulated from 100% natural and rare herbs and does not cause any damage to the hair or scalp. The ingredients do not contain the traces of synthetic dyes and animal ingredients. The chief ingredient used in the formulation of the company is Moroccan Gossypium Herbaceum. This plant is basically a variety of cotton and it is the active ingredient used in this product. The main reason for choosing this plant is that it has the properties and shades that are very similar to the human hair. It does not contain any traces of wool, like the case with the ordinary hair thickening products. Moreover, the outcome of all the hair thickening products formulated from the wool is unsatisfactory most of the time. On the other hand, the overall characteristics of the Moroccan Gossypium Herbaceum are very similar to the human hair. Another main advantage of this product is that it has a negative charge and the human hair has a positive charge, so as a result both the charges attract each other and they form the strongest bond. The bond is so strong that it is about 200% times stronger than the bond formed by the wool fiber. Caboki is equally effective in performing any type of physical activity and this product is not affected by the normal day to day working. The overall working of the Caboki is completely different in manner as compared to the other type of hair loss treatments. The tiny fibers of the product adhere to the follicles of the hair, and thus each strand of the hair becomes thicker than the normal. Moreover, the overall composition of the caboki is hypoallergenic, so it is equally safe to use with all types of scalps including the sensitive scalps. Furthermore, it does not cause any inflammation or irritation on the scalp. The other prominent feature of the caboki is that it is stain free. If you accidently sprinkle some of the fiber on your clothes, then there is no need to worry, because it can be cleaned completely without causing any stain. You just have to slightly brush your clothes or any other surface and it will be wiped out instantly. The caboki powders have the light-reflective properties similar to the human hair, so they cannot be differentiated by the naked. The application of the caboki will lasts until the user washes their hair by using shampoo. 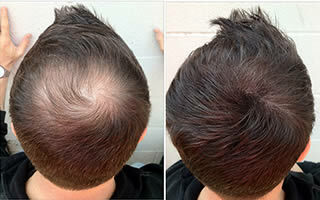 This revolutionary product is best for all individuals suffering from low to mild hair loss. Usually, the one product can be used up to 70 times continuously. This product can be purchased exclusively from the official company of Cyberteleshop. How to apply the Caboki? The application of this product is simple, but it requires adequate care. First of all, you have to wash and brush your hair, as you do in your normal routine. In the next step, you have to wait until your hair dries completely. This product cannot be used in the wet hair please do not forget that. In the next step, you have to sit in the air tight room and sprinkle this product on your hair in a gentle way. Please note that you will get the best results with the minimum usage of the product. In the final step, you have to wait for at least 15-20 minutes after the application. This time is required for the bond formation.